For my family (as is the case with most, I imagine), a carefully planned and prepared meal equals love. The first night of our stay, my Auntie Melinda steamed a large uhu (aka parrot fish, and you can see why) that she got for $39 at Tamashiro Market on an outdoor gas wok as part of our huge dinner spread. After steaming, the fish was topped with oil, green onions and cilantro. My sister and her family came over and also her husband’s parents, who were in town for their annual visit. In addition to the usual sides of salad, rice and veggies, there was Korean meat jun (the only dish bought vs. made), thin strips of beef coated with egg and flour, fried and served with dipping sauce. AND miso butterfish (black cod), a white, flaky fish marinated with miso, mirin, sake and sugar and then baked or broiled. 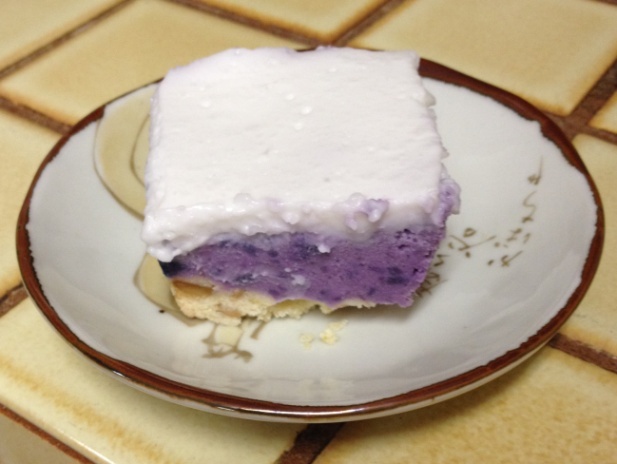 AND rainbow jello and a haupia “pie,” a layered dessert starting with a macadamia nut crust, then Japanese sweet potato (purple), then haupia (a coconut milk and sugar concoction with a custard-like texture). Waiting for me in the fridge the next morning was a Filipino specialty, halo-halo (“hodge-podge” in Tagalog). There are so many different versions of this dessert. Basically, it’s a concoction of condensed milk plus a bunch of wacky ingredients (kidney beans, rice, gelatin, yams). Auntie’s not-too-sweet version is filled with tons of grated cantaloupe, papaya, avocado and coconut. There are also tapioca beads, palm fruit and some strange pink Japanese gelatin that I always pick out. I put an ice cube on the bottom (if I’m lucky, as I was this time, Mom will have frozen fresh coconut water cubes), dump a bunch of halo-halo on top and eat it with my coffee. Super YUM. 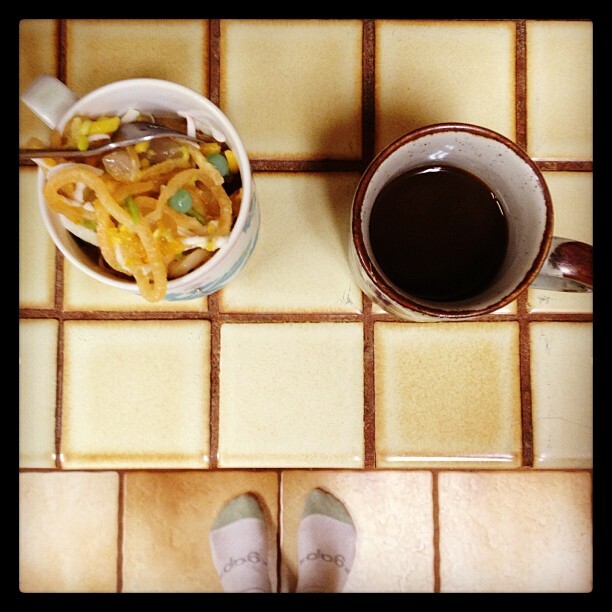 I love, love, love noodles. 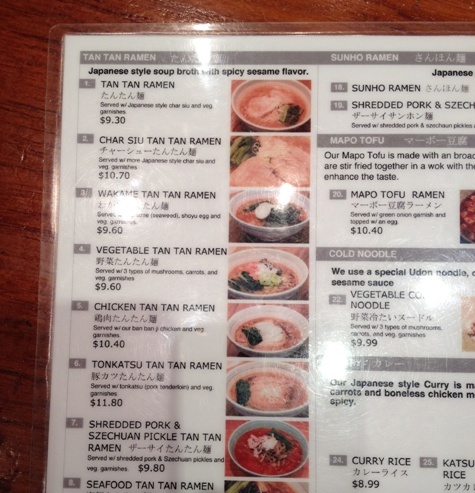 Italian pasta and Japanese ramen are at the top of my list. I can make Italian food all day long, but don’t know how to make ramen broth. 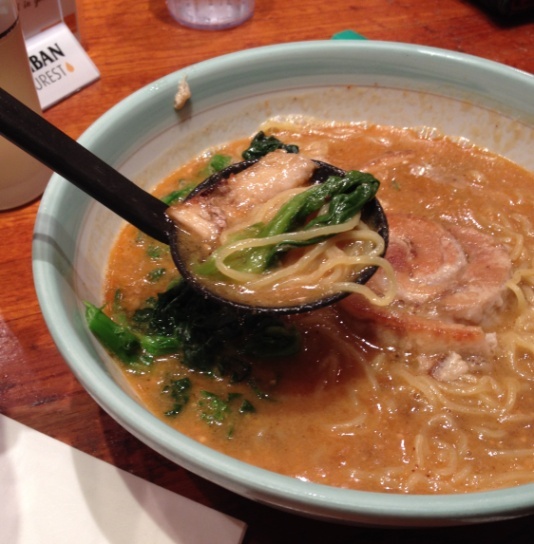 Whenever I go to Hawaii, I always ask my sister to come with me to Goma Tei, a small noodle shop in Ward Center. We usually sit at the counter and I always get the same thing – Tan Tan Ramen, a basic spicy broth with char siu (Chinese-style bbq pork), green onions and greens (broccoli rabe or spinach or some Asian green that is very similar). SO good. Salty, with a hint of sesame and just enough heat. That meal may very well have been my last taste of homemade ramen for 2014. (And dare I say 2015? No way. Surely not). And who knows? Maybe there is a hidden noodle shop in some Detroit alley that makes the best ramen noodles East of the Mississippi. Maybe. But… probably not. If you ever find yourself in Hawaii, I urge you to try some of the local flavors. They might be weird, they might taste icky, they might taste awesome, but they will most assuredly be made with love. This entry was posted in Family, Food, Hawaii, Places, Restaurants and tagged Auntie, Black Cod, Butterfish, Coconut, Cooking, Dinner, Family, Family Meal, Filipino Food, Fish, Food, Goma Tei, Halo Halo, Haupia, Hawaii, Home, Homemade, Island Life, Island Living, Japanese Food, Lunch, Noodles, Ramen, Sweet Potato, Ward Center, Wok. Bookmark the permalink. My mouth is watering! So many interesting foods. I’m sooo jealous! And hungry. Soooo much coconut goodness over there. You would love it.